I took a field trip today. It all started with a drive to Kilgore for Judy Hill's Home Show. Wow. And I'll say it again. Wow. Judy is skilled. Talented. Blessed. Go here to see some pics that Theresa took. Wow. Check out that lovely little feathered angel. She will soon be found on top of a tree in my house. 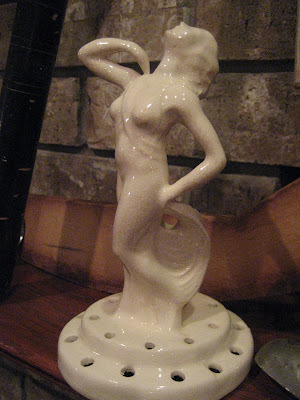 She is just one of my finds at Judy's. Such a sweet face! Maybe I'll show you more tomorrow. I met fellow blogger, Margo, at Judy's and we decided to head to Ethel's in Tyler. After a little shopping and visiting with Ethel, I decided to blog her. Check back later this week for that. She is just a delight! Check out my goodies from Ethel's. Not the white frame with cross...but, all the rest. Cool stuff, eh? I absolutely fell in love with this lady. While Margo and I were taking guesses at what the holes were for, Ethel chimed in that this beauty is a flower frog. Seriously. I thought maybe she would hold hat pins. What do you think? She has wonderful crazing. No cracks. And she is mine! Look at her poochy tummy. She's a real woman. I like her a lot! Hey! Too much to tell and not enough time to upload pics on my dial up! After a short visit to Margo's home, and might I add, she has a very cool look going for her, I headed home. It's always fun unloading and unpacking found treasures. I took lots of pictures. 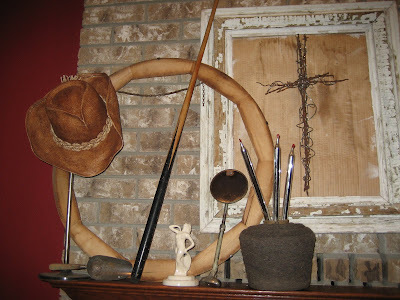 And have been finding new homes for what I won't take to Primitiques to sell. Back to it before I fall over from exhaustion! I've heard what was in the baggie, but I haven't seen it yet. Looking forward laying eyes on... uhmm... the contents! Glad you had a good trip! 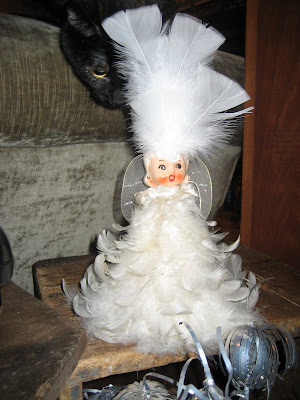 The angel looks a little like a feather duster with a face. I'm sure it is so much more beautiful in real life than it is in person. Yes, folks, I'm well aware that last sentence makes no sense. That's a little inside joke just for Mindy. Love you, dear! So glad you two had a fun time. I really did enjoy Judy and Melonie's creations, so pretty and inspiring!! It is legal, right? lol! yep, trust Ethel. See knows her stuff-that's a flower frog, a fancy schmancy one. Cool Haul! I LOVE the poochy tummy lady too! But I am not completely buying the flower frog idea...even if TrashTalk backs it up! I am sure we could think of more creative answers! Sorry I did not get to go to the open house. I was looking forward to meeting you!